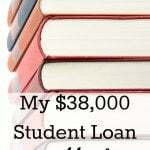 To tie in with my last post about why I think college debt is (sometimes) worthwhile, here is an article that I found last month about adults who have unfathomable debt. These people each have somewhere around $185,000 in student loan debt which is insane! None of these people graduated with a degree that lead to a job which they thought they would have. Research ways to get scholarships. Apply for all scholarships that your college offers. Remember to fill out your FAFSA before the deadline in order to be eligible for higher grant amounts. Most schools offer work study programs where you might be a residential adviser, work in the cafeteria, and so on. The work is usually very minimal but can pay off. This way you can first get general credits out of the way. Usually you can set up a plan to pay for tuition over a 4 or 9 month period, which will lessen the burden of having to pay tuition and fees upfront. I got my own apartment at the age of 18 and bought my house at the age of 20, so I never lived in a dorm. Even though I didn't live at home with my parents, I still saved a significant amount of money by not living in the dorms and having to pay for a food plan also. A lot of the people in the article used their student loans to pay for them to live as well. They should have gotten a job and not have used loans to support them. Your turn: At what point would you say that your college degree or debt would no longer be worth it? What do you think of these individuals who accrued so much debt? What would you tell them? Pretty much any debt of any kind is a bad idea these days. I do not agree with what Anonymous said. Some debt is needed and is OK, at least that's what I believe. Some people want a nice car, a house, boat (haha I can't afford that, I wish), a college degree and more. Not everyone is in the downs due to the economy and some can afford this. A bankruptcy lawyer that I know would agree with the fact that some people want nice cars, houses, etc. In fact, too many people insist that they must have these things.He also told me that the filings of personal bankruptcy for these people that had to have what they wanted has climbed astronomically starting in 2009. The bankruptcy court in my area has so many bankruptcies to process that it no longer takes the standard 90 days. It takes much longer due to the high number.Many of us want things, but there was a time when people worked and saved for what they wanted instead of incurring an insane amount of debt to satisfy their desires.An unexpected layoff at work, an unexpected illness, etc. pretty much devastates people these days who have NOTHING to fall back on. Nothing as in no saving and nothing but debt in the form of credit cards, student loans, mortgages and car notes.I have seen it time and time again over the last 3 years. I myself lost a good paying job due to illness. Going from a 2 income house to 1 income household changed everything. Thanks for both of your posts. I appreciate all opinions of course :)I believe that debt is ok, as long as it is what you can honestly and truly handle. Do not take on ANY debt if you do not think that right now or in the future you might not be able to handle it. Thanks Anonymous for your post. I very much agree with what you have said. Too many people take out loans for what they think they need, and then they lose their jobs and have no ways or means to pay for their loans.Right now me and my boyfriend are trying to live as if we are a one income household, even though we have two incomes. This way we are budgeting for anything unnecessary that may happen in the future. I utilized about 3 of those tricks to get through school… (grants, living at home part time, and summer/j sessions at a community college)My friend on the other hand took out loans for housing (She had her tuition covered…) and while she got a job right out of college, she's only making around 35k, and her loans are way more than that… and that was for housing alone.She could have stayed at home and lived with her folks… but she chose not too. To me, that crosses the line and I wouldn't have been able to do it. I agree, I wouldn't have been able to take out loans for housing. Housing at colleges is way too expensive. The college that I went to wanted $10k for the dorm every year, plus around $3k for the food plan. That was just much more than getting my own house (which I would of course be able to live in for 12 months and eat for 12 months, instead of compared to only 9 months of housing at school and food). The thing is many people take on the debt fully expecting to be a able to handle it. The bankruptcy lawyer I know even explained this to me. Unfortunately debt is debt. Unforeseen circumstances and all. Speaking of moving back in with parents, etc. I see more and more people with families that have to move their entire family back with one of their parents. People who used to have the 4 bedroom in the suburbs on the golf course are now broke. Heck, I saw a documentary recently that detailed people just like this that now live in their cars at Walmart parking lots.It sounds extreme and frankly unbelievable, but it happening more and more. Yes, it is prudent to live within the means of a single income and then you are prepared for the potential loss of the 2nd income.More and more are finding themselves at 0 income.I think saving money (and not in a 401k) should be more of a priority. Skip that impulsive magazine or candy purchase at the check-out lane.And by all means, skip the flat screen tv, computer, I-Pods, I-Pads, I-whatevers purchases etc (on credit cards) unless you have the money SAVED to buy these things. I can almost guarantee that the same people up to their eyeballs in student loan debt are still out there incurring consumer debt.Unfortunately this does not happen and people have to learn their own lesson. We live in a ME, ME, ME instant gratification society. An entitlement society and it's all collapsing right in front of us.My 2 years away from retirement relative has lost oodles in her 401k and was counting on only that to retire. Yet, I have watched her spend money on non-necessities for YEARS not planning her retirement by SAVING money in her saving account. She had already lost many thousand 3 years ago in 401k and had finally built some of that back up to only lose most of that again. 2 years from retirement is way to late to hope for gaining it all back again. Forgive the typos. No edit feature to correct them. I probably watched the same documentary as you. In this, people lived in cars and trailers and parked them at Walmart. And then one day a tow truck came by and impounded everyone's cars/trailers. It was very very sad to watch.Again thank you for your post. I don't have any credit card debt whatsoever, thankfully. Michelle, I agree that community college is a great cheaper alternative. My experience says that you can get just as good of an education at community colleges for a lot less! However, I think if you're going to go to a University, living with your parents is NOT the way to go. While it makes sense financially, I think it's likely to take a lot away from the experience you're paying for (in part) in the first place. College is often some people's first adventure into independence and I think perhaps, that's worth the debt. I know that living on campus taught me a lot about financial independence and budgeting because I couldn't constantly rely on my parents. As for loans and living expenses, I think that sometimes this is completely necessary! I moved to DC for my Master's and worked in related paid internships full-time for both years. There was no way these internships could support my travel costs, high rent, and food. However, I look back and as an unemployed recent graduate, wonder if getting that Master's and the $50,000 debt that comes with it, was worth it. So far, the jury is out. @Anna, thanks for your post! And yes I do believe that college is a great experience. If you can live on campus, then all the power to you. I lived with friends off campus, and that was tons of fun. And I should have probably clarified about the loans for living expenses. In the article it said that a lot of the people used the loans for living expenses such as beer, having fun and so on. I don't think any of the people had a job during college so they used their loans to live and were by no means frugal. I hope you find a job soon! What sector are you looking for a job in? @coupleasaving, having the whole college experience is a good thing! I stayed really close to home just like you and I still loved it.